KANSAS CITY, Mo. 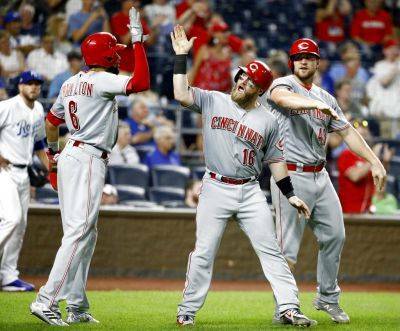 — Joey Votto hit a bases-loaded triple in the 10th inning after Billy Hamilton slipped out of a rundown, and the Cincinnati Reds beat the Kansas City Royals 5-1 on Tuesday night. Hamilton got hung up between third and home when pitcher Kevin McCarthy (4-3) tipped Tyler Barnhart’s line drive with his glove. McCarthy picked up the ball behind the mound and threw home, and Hamilton looked done until he sidestepped Alcides Escobar’s tag and dived back safely into third base to leave the bases loaded with one out. The Reds tied it in the ninth on Barnhart’s homer to lead off the inning. Barnhart drove a 2-2 pitch by Kelvin Herrera over the right-field fence into in the Royals’ bullpen. It was Herrera’s second blown save in 16 opportunities. After Barnhart’s home run, Herrera walked Votto for his first walk of the season in his 27th relief appearance. He also walked Jesse Winker with two outs before retiring Adam Duvall on a groundball to end the inning. In his previous two Kauffman Stadium starts, Kennedy had a 13.00 ERA, giving up 13 runs in losses to Tampa Bay and Oakland. The Reds loaded the bases in the second inning on Scooter Gennett’s leadoff single and walks by Suarez and Duvall. Kennedy got out of that jam when Jose Peraza flied out to center fielder Abraham Almonte, who threw out Gennett attempting to score. That was the only hiccup for Romano. He allowed only three singles outside of Dozier’s home run in eight innings. Royals: RHP Justin Grimm (low back stiffness) was recalled from his minor league injury rehab with Triple-A Omaha and activated. The Royals optioned rookie RHP Trevor Oaks to the Storm Chasers. OF Jorge Bonifacio, who is finishing an 80-game suspension, will begin a minor league rehab assignment Tuesday with Omaha. Major League Baseball suspended Bonifacio for testing positive for a performance-enhancing drug. Royals: Jorge Soler (bruised left big toe) returned to the lineup for the first time since Friday. Reds: RHP Tyler Mahle has allowed two earned runs over 10 innings in his first two June starts, going 1-0. Royals: RHP Jason Hammel is 2-1 with a 2.59 ERA in his past four starts.